Now winter really has arrived in SIKU city. But the Amarok-inspired model is already in production in Hanover  and this VW pick-up is by now a familiar sight on Germanys roads. Next winter, the vehicles made in Hanover will be on the road for the municipal authorities and are also equipped for winter service with snow plate. 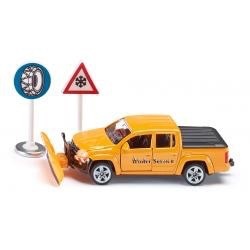 SIKUs VW 1:50 scale vehicles are designed in municipal orange with all the original features and numerous extra functions that offer exceptional quality models  including ploughing plate and typical lift and lowering functions. Of course, the ploughing plate can also be moved sideways. 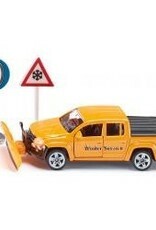 The set also includes two traffic signs, winter service lettering.